Kenneth Cole 3-piece Bag Sets, Purses & Wallets as low as $14.00! Up to 73% Off! 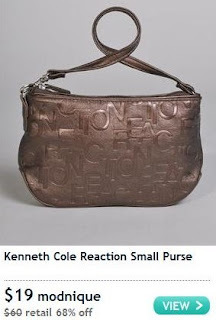 There's a great Kenneth Cole sale going on at Modnique right now. Prices are up to 73% off retail and ALL items are priced at $19 - $29, but new shoppers get $5 instant credit for signing up, allowing you to get something for only $14.00! There's lots of great items on sale, including 3-piece cosmetic bag sets, wallets, purses and clutches.